How Hard Can It Be to Run a Marathon? In Part II of my book Everyone’s Advice Is Wrong . . . Including Mine I detail a ten-step guide that will unearth your spirit from the demoralization of the cubicle and help you realize there is more to life than 9-5 which has inexplicably become 9-6. In Step 1: #EnjoyThePointsOfLife I discussed the necessity of leaving the everyday for the unusual- now possible thanks to the Points101 directions. In Step 2: Make Tuesday Humpday, I introduced how a simple nonconformist step can marginally increase your tolerance for the workweek while setting the cornerstone for your eventual departure. The novelty of this change will soon become unsatisfying. During boring days at work I would stare out my office window hoping to catch a glimpse of the ocean. As a resident of Arizona, all I could see was the endless desert hindering my escape. To stop falling for the mirage of the 401k, I came up with a solution. Once again, travel and adventure were instrumental in advancing my cause. This time my desire for autonomy would take me to the Northern Lights of Alaska where a 26.2 mile journey lay ahead. You’ve gained that nth pound of weight and have sworn off cake. Even overcoming Hump Day to enjoy Taco Tuesdays isn’t enough. More bad news: the 4th of July has passed and your next day off isn’t until Labor Day. Flustered, you check your bank account and wonder how you could ever consider quitting with so little saved up and so many bills due. The next step is to begin the journey of finding strength within yourself. It was the end of May 2012 when I was map making as general minimal counsel as an employee of ‘Baidu Maps’ (the Chinese equivalent of Google Maps) as I had coined it. Out of the blue, Brent emailed me, irritated that his coworkers had asked him to run a relay marathon, where each member of the group runs a leg as part of a team building exercise. I replied, “Marathon you say? How hard can it be to run a marathon? I think I will sign up.” A few hours later, I registered for the Moose Tooth Marathon scheduled for mid-August in, of all places, Anchorage, Alaska. I figured if I’m going to run my first marathon, why not do it somewhere adventurous. Also, I had read there was the distinct possibility of seeing moose or bears on the trail. What could be more motivating than a giant bear chasing after me when I hit the wall? I’m not trying to sound profound when I state that the journey of training, running, and completing a marathon is analogous to the journey of life but in many ways it is. When I signed up for the race, I naïvely thought I would receive support and encouragement. Quite the opposite; friends, family, and strangers alike all had doubts about whether I could finish. Even the prick guy who sold me my running shoes let me know that completing a marathon with less than 12 weeks of training was unrealistic. I am not sure what the motivation was behind their skepticism but I used it to keep me focused during the ups and downs. 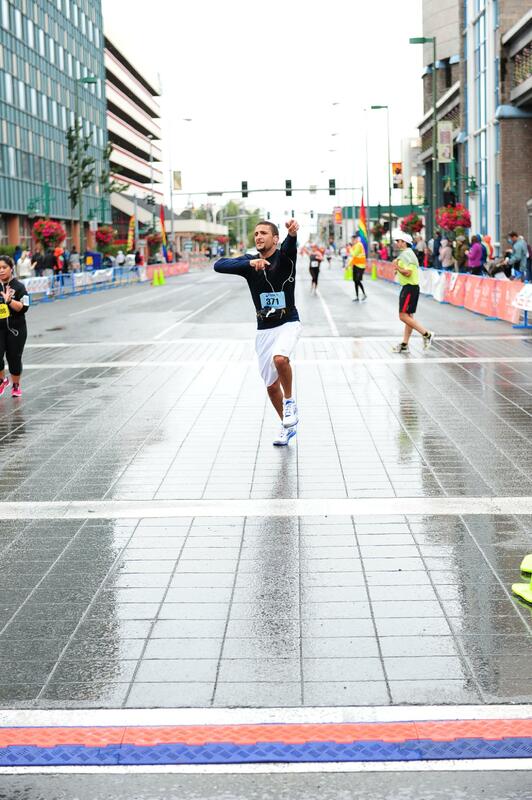 Running a full marathon is not a steadfast requirement for completing this step. Feel free to try your luck at a triathlon if you wish. I am partial to the marathon because I believe that anyone can run a marathon and finish. Even if you finish in 6+ hours, you finished. This is an accomplishment of a lifetime that will solidify belief in yourself and erase all doubts of whether you can conquer any future challenge. The full details of the taxing marathon training and race are described in great detail in the book. But for the sake of summary, here are the takeaways from the Steps covered thus far. The real fireworks begin in Step 4: Scorch The Bridge.